Though the first Peter Rabbit movie was overshadowed by the release of Marvel's Black Panther, it was still a major success for Sony. The children's movie earned over $320 million worldwide off of an initial $50 million budget, so a sequel was bound to happen. Now, it has been officially announced that Peter Rabbit 2 is moving forward, and will be released in early 2020. Writer-director Will Gluck is returning to handle both duties on the sequel, and the original cast also is expected back. The official release date for Peter Rabbit 2 is February 7th, 2020, which is pretty much around the corner. The first movie had impressive special effects as well as a very famous voice cast, including Margot Robbie, Elizabeth Debicki, Daisy Ridley, and Fayssal Bazzi. Domhnall Gleeson, Rose Byrne, and Sam Neill are the live-action human characters. 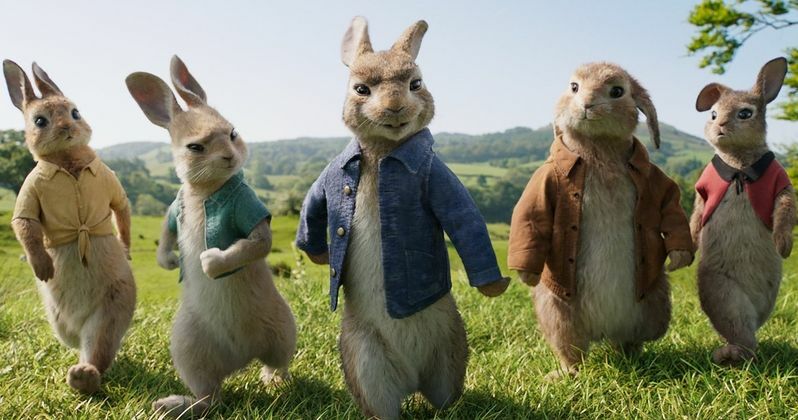 As previously noted, the original cast will reportedly all return for Peter Rabbit 2, which is great news for fans of the first Peter Rabbit movie. While the first Peter Rabbit movie was well received and did great at the box office, it still found some controversy. The film was even boycotted in certain areas for one particular joke that involved allergies. In the movie, the bunnies attack farmer Tom McGregor with blackberries because they know that he's allergic to them. He ends up digesting one of the berries and goes into anaphylactic shock while reaching for his EpiPen. The scene was labeled as insensitive to children with allergies from moms all over North America who even set up a viral campaign to boycott the movie. In the end, it didn't really matter since Peter Rabbit 2 is now coming out. The first movie introduced the Peter Rabbit character that many have known for generations thanks to the many adventures he's had in books over the years. However, Peter has an attitude this time around and hangs out with some rather rambunctious bunnies. Peter Rabbit 2 will more than likely see the war with farmer McGregor escalate even further, though it probably won't involve any attacks having to do with allergies this time around. Sony has learned their lesson about poking fun of people with allergies. Sony's Peter Rabbit 2 will hit theaters on February 7th, 2020 but isn't clear when production will start for the sequel. Adults who were initially skeptical of seeing another children's movie were pleasantly surprised when there were jokes in the movie written for them as well, leading one to believe that Sony will have another hit on its hands when 2020 rolls around. As for the first movie, it was just released on Blu-ray and DVD last week, so there's plenty of time to brush up on it before the sequel hits theaters. You can read more about Sony's decision to officially green light Peter Rabbit 2 over at Deadline.